Apple has formally announced its upcoming media eventÂ that will take place on Tuesday, October 4 at 10am Pacific Daylight Time on Apple’s campus in Cupertino led by Apple’s new CEO Tim Cook. 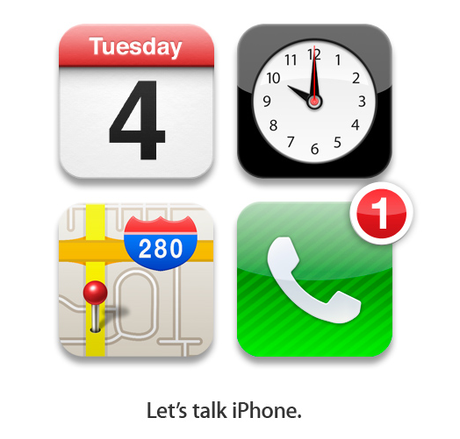 The invitation graphics includes four iOS app icons (Calendar, Clock, Maps, and Phone) along with the quote “Let’s talk iPhone.” The calendar says October 4, clock says 10:00, map points to Apple’s campus, and the phone icon shows one phone call which may indicate the new phone. So what to expected on Oct 4th? The most anticipated device of the year, the new iPhone. Public release of the shiny new iOS5.